Main-lining is a cannabis growing technique gaining a lot of popularity among modern cultivators. It is a great way to increase yields and is an ideal method for smaller spaces. Main-lining is a training technique that restricts apical dominance. 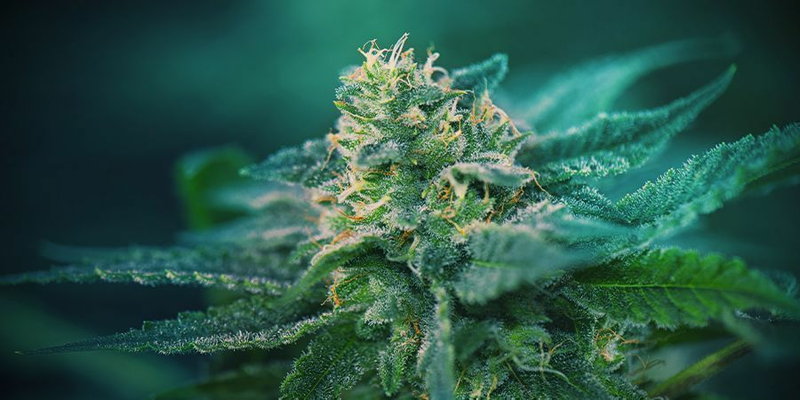 It combines topping and low stress training (LST), which forces the plant to focus its energy on growing a number of evenly-sized buds rather than a main cola surrounded by smaller flowers. Depending on space and height available, there is no need to stop at eight main branches. Letting the plants vegetate longer can produce sixteen or even thirty two main branches. However, this doubles the potential height with each topping. 60cm minimum height is required for an eight cola plant. 1m minimum is required for a sixteen cola plant, then 2m for a thirty two cola plant. At this point, it may be better to opt for a ScrOG and make more efficient use of the area, rather than the volume. Let the chosen plant grow out to six internodes. This allows for undershucking to make an air plenum below the branch manifold. Good air circulation always needs to be considered when growing cannabis. If you are planning on making clones, let the plant grow enough to let a cutting be taken at the third node. By this stage, some genetics will have enough side branching below node three to take cuttings also. Top/tip at the third node. Please don’t be too enthusiastic and grub-out the emerging tip too early. In order to guarantee a strong start to the process, leave a sprig of stem behind. This will prevent the stalk from splitting when force is applied later when the buds are weighty (mmm weighty buds). A split stalk hinders nutrient distribution and is a wound where pathogens can enter. Undershuck all plant matter up to the third node to leave a bare stem. This allows for air circulation underneath the dense canopy when it forms later. When emerging branches are strong enough, tie them down horizontally. SOS - Save Our Sinsemilla. We’ve heard the distress call from growers struggling with sick cannabis plants. This is your emergency rescue grow guide. Now, create the branches that will become eight colas. Eight colas will make any grower happy, and they will grow into energy and space-efficient plants. Let the two new main stalks grow until they have four nodes each. Remove the growth from both sides of the second node. This way, the emerging branches are growing on the same side of the branch and are more easily manipulated. Top each remaining branch at the third node once more. There are now eight primary branches. Continue to train each branch horizontally and equally spaced until they are growing vigorously again. Continue vegetation. If you are familiar with the strain, you will know when to flip the photoperiod to 12-12. If you are unsure of genetic performance, flip the light cycle when the plant is half the desired height. Continue training the plant horizontally as it grows, keeping the growing tips at an even height. Bend each branch away from the centre as it extends, and tie it into place. If you are restricted for room, bend one or two branches back to the centre of the plant. Make sure to keep the tips as level as possible. At this stage, you may decide to create more colas to make the total sixteen. Simply repeat the process. Let each new branch grow to five nodes this time, then top and shuck them once more. Leave to vegetate until desired size. If you have plenty of space or are playing outdoors, repeat the process again to create a thirty two cola plant! 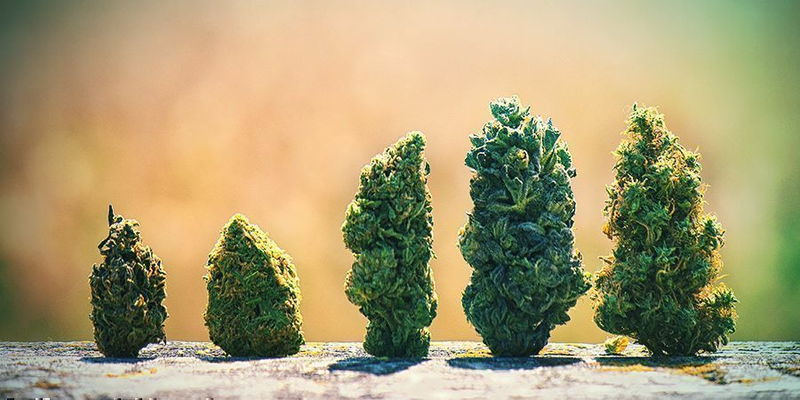 Rather than growing each branch to five nodes, grow them to eight (Fibonacci numbers work very well for even cannabis spacing) before topping and shucking. This way, room will be made in the future canopy for the colas to be spaced. Topping too soon with many colas can mean undesired clustering and risk of mould later on. These are outdoor multi-cola plants in mid-vegetation. Notice the heavy shucking to prepare for future air circulation with good cola spacing. These plants would be 2m tall if left alone. You will now notice why this technique is called main-lining. Rather than having lots of side branches that all fight for nutrients and a main cola five or six times larger than other flowers, the plants are evenly developed. There is no shading, and they enjoy great airflow. A lot of height has been avoided, although they will be very bushy and voluminous as the buds develop. Creating a manifold in the early stages of main-lining does two things. First, it ensures that the plant’s nutrient uptake is not interrupted. All the juice goes into developing the chosen branches and flowers. This stops popcorn buds and other stringy, poorly grown development under the main canopy. Secondly, manifolding creates an air plenum that allows for unhindered air circulation. When the branches develop during vegetation and flowering, good airflow is important. Air circulation beneath the canopy helps prevent a number of pathogens, especially mould. It also ensures efficient gas exchange at the leaf surfaces. This will differ from pheno to pheno. Continually appraising your grow will inform you when and where to defoliate. Sativas can generally handle a heavier defoliation as they tend to produce more leaves, even after the 12-12 flip. Some indicas and Kushes, however, will only stretch after the photo-flip and won’t produce more internodes. Over-enthusiastic defoliation during vegetation can undesirably result in less flower sites. Growing cannabis isn’t absolute step-by-step science, but ebbs and flows with phenos, temperatures, and seasons - even indoors. Uniform light penetration through the entire canopy is desired while leaving enough leaf material for transpiration. Start by removing the large fan leaves during vegetation when obvious crowding and shading starts to happen. The branch ends will be growing almost vertically by now and starting to take up volume. A tomato ring is a good investment for main-lining indoors. Used by gardeners to support tomato vines as they grow, tomato rings provide a sturdy frame to evenly seperate the eight branches. 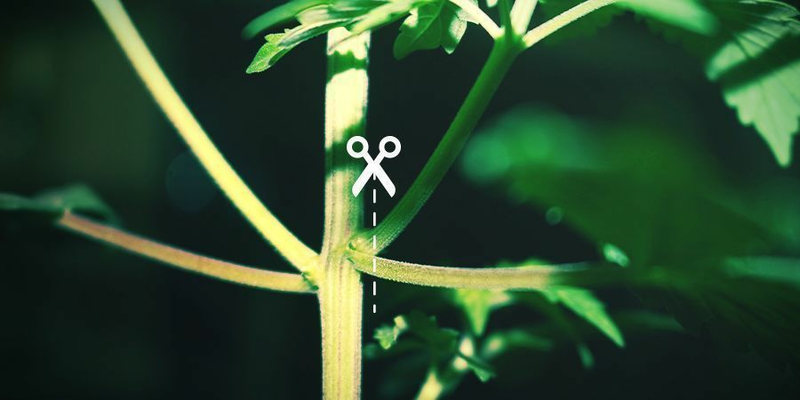 Regularly trim away any random growths that can sap bud-building energy. Cannabis is notoriously virulent and will sprout new sugar leaves and branches out of raw stem. Just clip these off; they will only be places for nasties to accumulate in the shade and steal precious flower power. Cannabis flowers photosynthesise more efficiently than leaves. Removing a leaf to let light penetrate to a shaded bud cluster will be better for end yields than leaving the surface area of a leaf for photosynthesis. Tricky cannabis cultivars will make the shaded flower the same size as its sisters in the light. Only they do not fill out properly nor harden and tighten as they mature. Hence the name popcorn buds - light for their size. There are a number of advantages to main-lining your cannabis, especially for saving space indoors and encouraging lots of large colas. Big yields are the real bonus of main-lining. Giving so much attention to providing excellent flower substructures in the plant’s early life really pays off at harvest time. Trimming becomes automatic as most of the buds are almost exactly the same size and shape. Many commercial growers love main-lining as the processing after harvest is more efficient. End of line display is also more appealing to the eye at the point of sale. Rigidly controlling the plants through topping and training is a very efficient use of space. Not only are the plants all uniform, making the environment very easy to control, the aesthetic can be quite breathtaking. Nothing like a sea of perfect buds to make a mouth water. Main-lining is easier than other training methods. Once the initial manifold is attended to and the main branches are fixed in place, tying down is done, and then there is only canopy maintenance for the life of the plant. This is less time spent training for you, and less risk of injuring the plants due to handling accidents. The single layer of canopy reduces the risk of bud rot and mould. Even air distribution around evenly-sized buds guarantees less nooks and shady spots where pathogens can take hold. Continuous air flow over the grow medium resists bacteria and insect infestations while aiding the wet-dry cycle via evaporation. After harvest, the entire crop will dry more evenly. 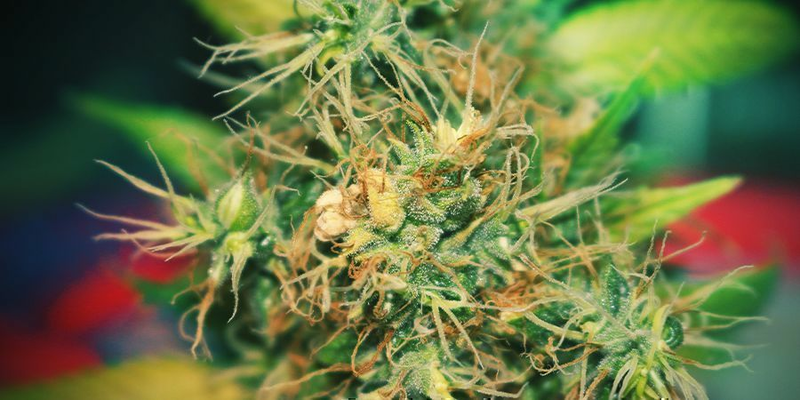 When buds are the same density and contain the same moisture content, they will need less attention. What’s good for one is good for all. The disadvantages of main-lining are few, but they need to be seriously considered. In the early stages of vegetation, plants need to recover from the toppings to regain volume and growth speed. This lengthens the overall grow period by ten days to two weeks. This technique cannot be used on autoflowering strains. They are what they are from seed. Low stress training is okay for autos, but main-lining is right out. The recovery time from topping and shucking would be half the life of the plant and unnecessarily remove flower sites. Low wattage lights like fluoros or CFLs do not have the penetration needed to reach the bottom of the long buds produced by main-lining. 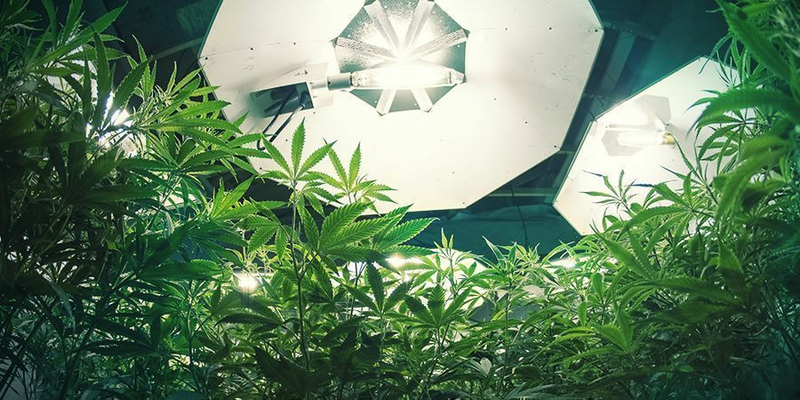 A minimum 150W HPS or MH lamp or equivalent LED is required to get satisfying yields. At least 75cm height is needed from grow surface to light source to do an eight cola main-line. Consider your space requirements accordingly. There is something intriguing and genuinely rewarding about growing big cannabis flowers. Main-lining gives a desirable look to cannabis in the container, and on the shelf. It also increases yield per m² compared to plants that remain untouched. The early attention required is paid back in the form of less maintenance for the life of the plant and big, juicy buds.